← It’s National Night Out in College Hill: Next Tuesday, August 2! At College Hill Sundries, The People’s Perk & the burrito truck! 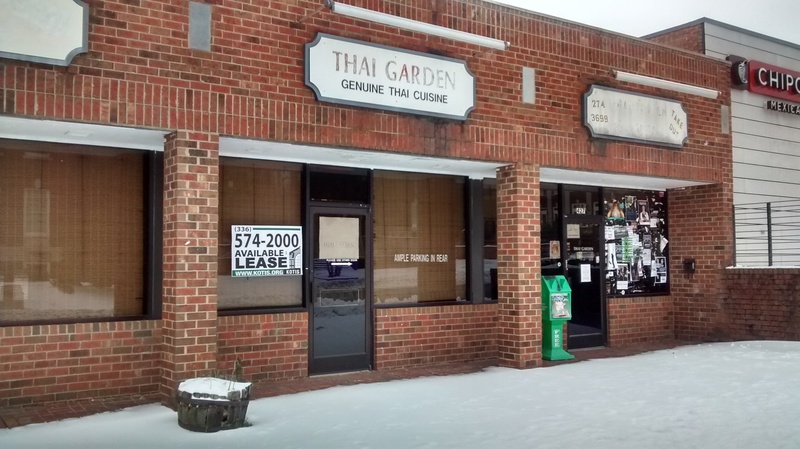 The former Thai Garden location on Tate Street will be split in two for a cookie shop and the business district’s fourth pizza restaurant, The Business Journal has reported. The Cottage Inn Pizza chain will open its first North Carolina store in two-thirds of the location. Some of its restaurants are open as late as 3 a.m.; others offer delivery as late as 4 a.m. It was founded in 1948 in Ann Arbor, Michigan, and now operates more than 50 restaurants in Michigan and Ohio. It is expanding into Florida, South Carolina and Texas as well as North Carolina. Cottage Inn will join New York Pizza, Slices and Manhattan Pizza and Subs on Tate Street. Insomnia Cookies will open next door. The chain offers a variety of cookies, cookie cakes and ice cream. It delivers as well, typically from noon to 3 a.m. It has North Carolina locations in Boone, Chapel Hill, Greenville and Raleigh. The chain was founded in 2003 in Philadelphia and now has locations in most states east of the Mississippi. On the other side of Tate Street, Smoothie King opened last week in the storefront formerly occupied by The Space and Maya Gallery. This entry was posted in Businesses, Tate Street and tagged Cottage Inn Pizza, Insomnia Cookies, Smoothie King. Bookmark the permalink.